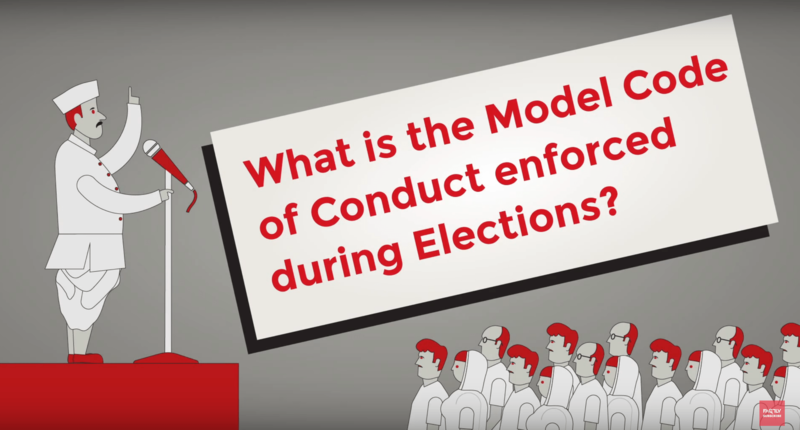 The Model Code of Conduct is a set of guidelines issued by the Election Commission of India to regulate the conduct of political parties and their candidates in the run up to elections and is aimed at ensuring free and fair elections. Though the Code doesn’t have any statutory basis, it has an indisputable legitimacy and parties across the political spectrum have generally adhered to its letter and spirit. Aim: To ensure free and fair elections (Under Article 324 of the Constitution). Kerala was the first state to adopt a code of conduct for elections (in 1960 Assembly elections). So, what is permitted and what is not under the MCC for the party in power? Is social media covered under the MCC? When it comes into force? The Model Code of Conduct comes into force immediately on announcement of the election schedule by the commission. The Code remains in force till the end of the electoral process (result declaration). It is also applicable to a “caretaker” government on premature dissolution of a State Assembly, as was the case in Telangana. Is the MCC legally enforceable? But how does the EC enforce the MCC without statutory backing? The EC ensures that ruling parties at the Centre and in States adhere to the code, as part of its mandate to conduct free and fair elections under Article 324 of the Constitution. In case of electoral offences, malpractices and corrupt practices like inducements to voters, bribery, intimidation or any undue influence, the EC takes action against violators. Anyone can report the violations to the EC or approach the court. The EC has devised several mechanisms to take note of the offences, which include joint task forces of enforcement agencies and flying squads. The latest is the introduction of the cVIGIL mobile app through which audio-visual evidence of malpractices can be reported. There are examples of the EC taking punitive action against violators. For instance, during the Lok Sabha elections of 2014, when it banned BJP leader Amit Shah and Samajwadi Party leader Azam Khan from campaigning in Uttar Pradesh, and ordered criminal proceedings against both politicians for making “provocative” and “prejudicial” statements while canvassing. The ban on Shah was lifted after he apologised and promised to not violate the MCC again. Khan showed no remorse, and he remained banned from campaigning for the rest of the election season. What are the key malpractices? Any activity aggravating existing differences or creating mutual hatred or causing tension between different castes and communities, religious or linguistic, is a corrupt practice under the Representation of the People Act. Making an appeal to caste or communal feelings to secure votes and using places of worship for campaigning are offences under the Act. Bribery to voters is both a corrupt practice and an electoral offence under the Act and Section 171B of the Indian Penal Code. Intimidation of voters is also an electoral offence, while impersonating them is punishable under the IPC. Serving or distributing liquor on election day and during the 48 hours preceding it is an electoral offence. Holding public meetings during the 48-hour period ending with the hour fixed for the closing of the poll is also an offence. What if a party or politician ignores the notice? The ECI believes that the voter doesn’t forget or forgive a politician who tries to take on the election regulator or attempts to brazen it out. There are numerous examples of politicians who got into a slanging match with the ECI over MCC violations, and were severely punished by voters. what is role of castism in bihar election how do we write…..nd from whre we will fetch data.